Thinking of making Beamsville your new place to call home? This unique and private property is situated on a nice quiet street. Backing on to an open field surrounded by forest. Living in a subdivision has never been so private ! Centrally located . Just 25 mins from Burlington and 20 mins to St. Catharines. This home has easy highway access with the GO bus, and car pool area located close by with the GO train coming shortly. 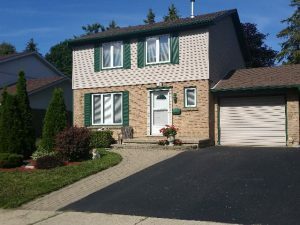 Close to schools, amenities, local wineries and the Bruce Trail. This home was custom built in 2007. It has 2400 square feet of living space plus more with the professionally finished basement. This home has 3 oversized bedrooms. 3 baths and one half bath. Large upstairs laundry room with lots of cabinetry and storage! Large eat in kitchen with island. This island seats 3 people comfortably and contains a wine cooler, storage shelves and a recycling/pet food storage center. When entertaining, another 2 people can easily be added to the seating arrangement. The living room has a wonderful view of the forest behind. A home office is situated on the main floor with beautiful French doors, built ins and closet for storage. A professionally finished basement with bar, games area, pool table, lounging area and a 3 piece bathroom. An entertainers dream. The garage and garage door are fully insulated with lots of cabinetry for storage and lots of extra lights. Outside has been professionally landscaped with an added feature of an underground sprinkler system and a water drip system for all your hanging plants. Makes life easy! The back deck has the added feeling of an extension off the house. Awesome spot to pour yourself a drink and just relax looking at the view from either the deck or hot tub. This house offers a surveillance system for added security while away. Lots of pots lights inside and outside all on dimmers. Outside garden lighting both front and back has been installed. This house is also wired for sound. A gas line has been run to the deck so no worries about running out of propane while barbecuing.